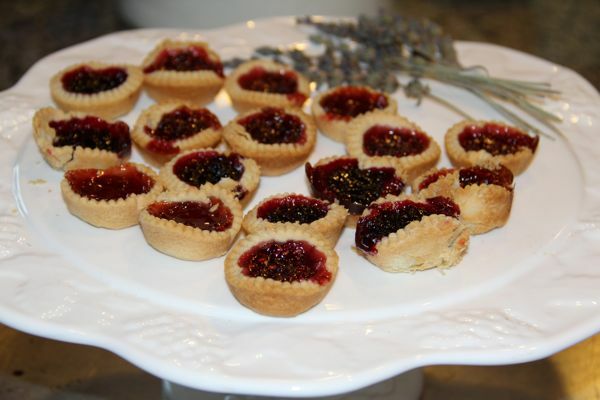 Boysenberry, and strawberry, and raspberry pies. Bite sized delights, in a flaky, buttery crust. I've made variations of these since I was a little girl... when my mommy would let me roll out the scraps of her pie crust. I never did take the time to learn to make a good pie crust, but now, with the help of Trader Joe's frozen pie crust, I can still make these tiny favorites. Over the weekend I baked vegetarian pasty for the boys, and there was just enough leftover dough for Maria and me to roll, and cut out twenty-four cookie sized crusts, which we tucked gently into the mini-muffin pan. Then into each pie shell, we dropped a dollop of preserves. Apricot is my favorite. You can make them this simple, or even add tiny cut out dough toppings, or sprinkle a few chopped pecans, or walnuts on top. I baked them at 350 degrees Fahrenheit, until they were golden and bubbling. And there's always some helpful child who comes around, offering to eat the ugly ones! The ugly ones are so yummy. Yummy indeed! Those look delicious! I love boysenberry. Yummy. Perhaps I need to look for that pie crust next time I'm at TJ's!